The Calheta Beach is near the town Calheta, on the island of Madeira, Portugal. Maderira is of volcanic origin and is not blessed with much natural sand, so the government barged sand from Western Sahara, a Non-Self Governing Territory which has been largely occupied by Morocco since 1975. The beach and breakwater are totally man made. Large and sparsely populated Western Sahara is nearly 100% desert and has plenty of sand to spare, but the sand-imports have been quite controversial. Opponents of the Morrocan occupation say that removing the sand is a violation of international law, since the consent of the people of the territory is required in the exploitation of the territory’s resources. The charge is that the Maderia government neglected to consult the Saharawi people on the sand purchases and instead opted to engage in business with Morocco. Like Sint Maarten, Madeira's airport is very unusual, but not for being near the beach. Instead Funchal Airport is built on pilings over what used to be ocean and makes most lists of dangerous airports. The unusual political status of Vancouver's Wreck Beach has preserved a long standing tradition of nakedness. Down steep trails from the University of British Columbia, Wreck Beach sits on unincorporated park land administered by a regional district, not the prudish city. Getting politicians from all over Metro Vancouver to strip a clothing optional beach of its clothing optional status is just too much trouble, so the sun worshipers continue within a few minute drive of the big city. Estimates are that 500,000 people visit the beach a year for an all over tan. Some volcanos develop huge underground reservoirs of superheated water. Over time, this water will escape to the surface — cooling on the way. There are two such fissures at Hot Water Beach issuing water as hot as 64ºC (147ºF) at a rate as high as 15 litres/minute. The hot water contains large amounts of salt (NOT salt water), calcium, magnesium, potassium, fluorine, bromine and silica. Visitors are advised to come around low tide and to bring a bucket and a spade. Dig a hole and soak in your own hot tub. The bucket is to bring in cold ocean water to your hole to prevent burning tender parts. Maho Beach is a famous spot on the Dutch side of the Caribbean island of Sint Maarten. Plenty of white sand and warm water but the big attraction is Princess Juliana International Airport immediately behind the shore. The proximity to the second busiest airport in the region does more than facilitate quick seaside access for arriving vacationers. The very short runway at nearly sea level requires heavy jet aircraft to come in very low at to touch down at the beginning of runway 10, just across the road and a low fence from the sand. Planespotters love the unique opportunity to get within a few meters of operating aircraft and local bars even publish flight timetables on caulkboards. The Sunset Beach Bar and Grill has a speaker on its outside deck that broadcasts the radio transmissions between pilots and the airport's control tower. 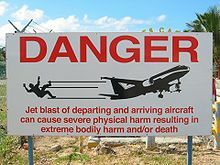 The beach's proximity to low flying jumbo jets does create a unique hazard. Unprepared sunbathers can be blown into the water from jet blast. Signs warn sunbathers that jet blast can "cause severe physical harm.. extreme bodily harm and/or death." And here I thought sharks were the biggest beach hazard. Credit: Wikipedia Creative CommonsGlass Beach is now found in MacKerricher State Park near Fort Bragg, California. Decades of dumping garbage into the ocean has created a situation where wave action turned the discarded glass into a whole beach of sea glass. Sea glass is small, smooth, colored glass pieces that many people find collectible. Sea glass is commonly found on seashores near populated areas, but rarely in the quantity that occurs at Glass Beach. However, there are similar glass covered ocean settings in Benicia, California, Guantanamo and Hanapepe, Hawaii. In 1967, the North Coast Water Quality Board and city leaders closed the area. Various cleanup programs were undertaken through the years to correct the damage. In 2002, the California State Park system purchased the 38-acre (150,000 m2) Glass Beach property, and after cleanup it was incorporated into MacKerricher State Park. The beach is now often visited by tourists. When the beach was cleaned up people were quickly attracted to harvesting the beautiful glass. Before the uniqueness of the beach could be destroyed the California Parks & Recreation Dept. took over the beach and banned the removal of the glass. Access from the road down to the beach is regarded as somewhat treacherous because many unprepared visitors do not wear proper shoes. The Japanese think of everything. The Seagaia Ocean Dome was an enclosed, temperature controlled waterpark and artificial sand beach that accommodated 10,000 happy fake beach goers at a time. The silly part is that Ocean Dome is about 300 meters from a real beach with real waves and real sand. Of course the nearby real beach lacks the artificial volcano that spews smoke every fifteen minutes and flames on the hour and sometimes it rains on the real beach. Inside the air temperature was always held at around 30 degrees Celsius (86 degrees Fahrenheit) and the water at around 28 (82 degrees Fahrenheit). Instead of actual sand the facility sported crushed white marble sand, which is almost identical to real sand but doesn’t stick to your body quite as much. The Ocean Dome was officially closed on October 1, 2007 as part of a renovation and partial re-branding of the surrounding resort. When it operated Ocean Dome was certified by Guinness World Records as the world's largest indoor waterpark. The building is still there and measures 300 metres in length and 100 metres in width with the world's largest retractable roof. On sunny days the roof opened to blue sky, while on not so sunny days the closed roof gave the appearance of blue sky. Ocean Dome opened in 1993 with a peak visitor count of 1.25 million in 1995. Entrance cost was ¥2600 per adult and ¥1600 for children (roughly 30 and 20 USD in 1995 respectively) depending on the season. It closed in 2007, perhaps because of the shear cost of operating such a huge facility. The massive surrounding resort continues to offer a myriad of activities, including that real beach 300 meters from Ocean Dome. Very interesting read, was like opening a tube of pringles. Once I started reading I just couldn't stop. Awesome :) That's the desired effect. Wow! Fascinating article with some awesome photos of beaches. I live near Laguna Beach, and it seems rather plain Jane, compared to some of these exotic places!! There are some spectacular beaches in the world. Ones with palm trees, great waves, and various colors like white sand, black sand, pink sand, purple sand etc. For this collection I decided to focus on unusual for man made reasons, though Hot Water Beach is not really man made it's just really too cool not to include. Great article and pictures. The Maho Beach really inspires me. Interesting article...I have to check out Maho Beach someday. That's insane. Other photos show a cafe right beside the runway section and town behind that. Sit sipping a pina colada and get blasted by the jets. That jet photo is unbelievable, not sure my wife would go for that beach! Madeira looks pretty cool,,,, ah if we could ever get away from work.. Cheers! What an interesting article. I really must visit a couple of these beaches- particularly the one in New Zealand with the hot water! I've never been a beach person, more into fresh water lakes and streams. But I found this very interesting. The plane flying over head is just insane. If I could visit any I think it would be glass beach, the glass shining in the sun would be lovely. I searched with the family for beach glass but a whole beach made from beach glass is pretty cool. I am ready to get a shovel and a bucket and go sit in a big sand hole and relax. :-P Great article...definitely interesting and definitely one that you have to read all the way to the end. I probably would have enjoyed being a fake beach goer in Japan as well. :-P Thanks! Great article - congratulations on the feature! excellent article. i laughed out loud at the irony of the japanese indoor beach. we visited NZ a few years ago and hot water beach was one of our favorite outings. we went during the NZ winter though so it wasn't nearly as crowded as your photo (but still fabulous and interesting all the same!). Congratulations on the feature!! I love the beach, and the photo of Maderia Beach is breathtakingly beautiful! I worked in the yard this afternoon, so I am definitely going to choose the Hot Water Beach in New Zealand. Very interesting article, complete with outstanding pictures. Congratulations on being featured. Weirdly amazing, specially that fake beach. I won't be thrilled over planes flying over the beach though (Maho beach). Great feature! Great article, kept me keen the entire read. Can't believe some of the beaches are allowed, the jets one or glass one for example. Well done. Some people just don't believe that St Maarten airport is real, or that it's a photoshop job, yet, it is for real.